Harvesting is even simpler than mining, because you don't need extra tools to reveal the exact location of the materials. The only thing you need to learn is the name and shape of the vaulable plants to identify them on the field. There are robots specialized for harvesting plants - use them to be more efficient. The process of actually harvesting is not unlike mining. First, equip your robot with a harvesting module. 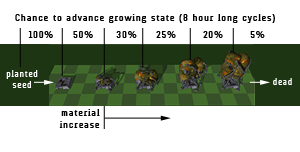 Harvester modules also need charges to operate, but unlike mining modules, harvesting modules use only one kind of module. After you've found a valuable plant on the field, simply lock the tile below the plant, then activate the harvester module. The harvested material will appear in your robot's cargo hold at the start of each harvesting cycle. If you depleted a harvesting site, don't panic. The natural flora will eventually grow back - you just need to wait a while. In the mean time, search for other plant-covered areas! On certain parts of the planet surface, the soil is fertile enough to feed newly- bred plants. Organic incubator technology is actually a half organic half machine device that needs to be deployed onto the appropriate place to in order to make the plant grow. Check Field accessories section on the market and choose Organic incubators. After you've purchased the deployable incubator, put it into your activated robot's cargo hold. You can later deploy the incubator on a tile that is fertile enough. You cannot deploy any incubators within a 1000 meters range of terminals and outposts. Unlike other plants, Noralgis doesn't have any height restrictions. It can be deployed both on lowlands and on top of a hill. To determine which tile is fertile enough, look for other plants as indicators, such as Oryovia and Prismocitae. Plant your incubator near them. You need to leave a tile between each incubator, otherwise the seeds will kill each other. You will see wether the seed is capable to grow and reaches its first cycle within 8 hours. The plant will replenish if you leave at least 1 cycle of material on it.